I was cooking. Okay. I was actually slicing oranges using a mandoline. To put in a fruity drink. And I sliced a large portion of my thumb off. Or almost off. It still hung on by some skin. I screamed and put it under water and screamed some more. Blood was pooling in the sink. I made my son cry. I ran out to the car and opened the garage and tried to get a hold of my husband and let the dog out and then called a friend to take the youngest to soccer. He couldn’t get the dog in the house so I drove to my husband’s office with the dog while keeping my thumb wrapped in tissues and above my heart because I remember something about keeping limbs bleeding above the heart. Or was it below? The girl at the register asked what I’d done and I told her I sliced my finger and got 8 stitches. She was shocked I had to get so many stitches. I remarked, “Well, I did get it done by a dentist.” She didn’t reply to that. This is the second time my husband has fixed a cooking accident for me. And neither time did I get nitrous. I’m a warrior. You may be wondering what could be the pro of all of this and I shall tell you. 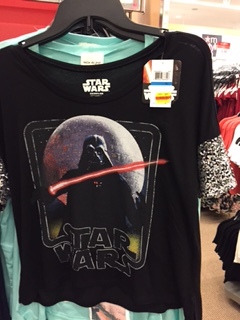 I decided I’d earned this $5 sequined, Darth Vader shirt. It’s gonna make the scar on my thumb invisible. This entry was posted in Uncategorized and tagged church, cooking, dentists, injury, mocktails, mom, oranges, ordering out, pain, stitches. Bookmark the permalink. Ow! Damn these things (should they be labeled ancient torture devices?) are dangerous. My lovely wife did similar as you​, though not as thorough a job with her thumb, with the new mandoline she gave our daughter last Christmas.